With the frequent digitalization in India, about all organizations are shifting towards making their online presence. Entrepreneurs are using multiple expensive and inexpensive marketing methods to revamp their social reach but the heavy investment is not possible for all size of organizations. Hence, Toll-free number service is a top affordable solution that helps businesses to reach their customers without paying much. This number is reflected on the company website and the caller can call on the same number free of cost for any product, service or company related query. In the early days, you were required a proper infrastructure before setting up a business that needs plenty of amount and time both. With the use of an easily memorable toll-free, you can run your business everywhere without investing much time and money. Most of the organizations are using toll-free numbers for their business. The prefix attached to these numbers 800. 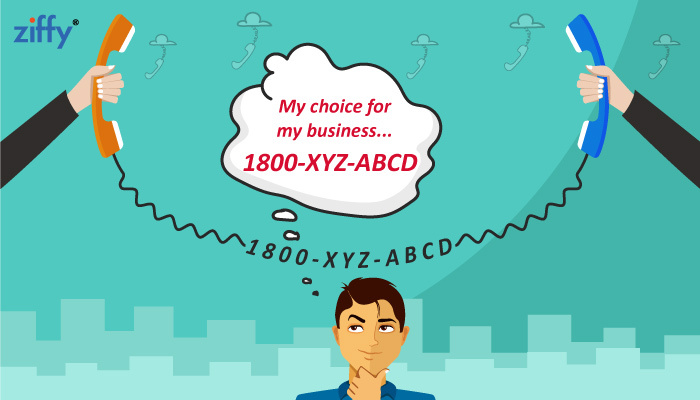 888 etc., gives callers a feeling to make a free call for any query. These are the trendy numbers because these numbers are very eye-catchy and easy to memorize. The format of vanity number is 1800-XYZ-ABCD. These numbers play a great role in your business branding as callers have to put less effort for dialing the easy sequence of numbers. These numbers are area-bound numbers so these are used only within a specific region where the code can be used. Very first, the toll-free number should be used by those organizations only which can afford the call rates. Toll-free numbers are always preferred by the customers because they don’t need to pay a penny for their any sort of query. The make calls free of cost and ask for all the problems or confusion they have. The toll-free numbers are used to increase the company access to the customers. No wonder, creating new customers or prospects is way more tough than retaining the existing customers. Always remember, the old customers are the advocate customers and only advocate customers contribute a big portion of the business benefit. So, now when you relocate your business, you might lose your old customers and push your business in danger. In such situation, a toll-free number works greatly and can save your business growth. No matter where you do shift your business, your old consumers can contact you with no trouble and extra investment. The customers can call you anytime and make purchase smoothly. Apart from customer retention, the toll-free numbers help you to improve your products and services by receiving the genuine feedback from the users. Users can easily share the problems they are facing after the use of service or products so you can fix the bugs in order to fulfill the customer need. The toll-free number service providers offer companies an IVR along with the number that helps customers not to wait much and redirect their call to the concerned department. Also, each call is recorded and maintained in the database. This information can be used in the future for better decision making or business model optimization. Thus, it can be concluded that using a toll-free number for making a good online presence is a great stay that works effectively. It also helps you to find the feet in the competitive market. in "Cloud Telephony, Vanity Numbers"
Previous Previous post: An IVR Recording Enhances Your Caller Navigation! Next Next post: An 1800 Number Makes Your Business Sound More Professional!